Take full advantage of your Spectra system by familiarizing yourself with all of the arming methods. Note:If your system is not partitioned (see Partitioning on page 22), everything is considered as belonging to area 1. After entering a valid arming sequence, an Exit Delay Timer will provide you with enough time to exit the protected area before the system arms. The keypad may beep during the Exit Delay and the (Keypad) icon will flash with the number of the partition in exit delay. To disarm an armed system or an alarm, enter your access code. An entry point, like the front door, will be programmed with one of two Entry Delay Timers. When an entry point is opened, the keypad will beep until you disarm the system. Your alarm system will not generate an alarm until this timer elapses. To disarm alarms generated by a Delayed Fire Zone, please refer to Fire Alarms section. How Do I Disarm an Alarm? All zones where alarms have occurred will be stored in memory. The system will erase the contents of the Alarm Memory every time the system is armed. How Do I View the Alarm Menu? Press the (Speaker with “?”) key. The (Speaker with “?” icon will flash and the corresponding zone numbers that were in alarm the last time the system was armed will illuminate. Press the “X” or (Speaker with “?”) key to exit. This method will arm all the zones in the selected area. Close all zones in the desired area. If required, press the key corresponding to the desired area,  or . For both areas, press the other key after the confirmation beep. Note: Regular Arming can also be activated using Auto-Arming, a Keyswitch, or One-Touch Arming. Instant Arming is similar to Stay Arming. Instant Arming partially arms your system and enables you to remain in the perimeter after the system is armed. However, Instant Arming ignores any Entry or Exit Delays Therefore, any armed zone that is breached will immediately generate an alarm. How Do I Instant Arm? During the Exit Delay press and hold the (Person in House) key for 3 seconds. During Force Arming, any open zones are temporarily “deactivated” so you can rapidly arm the system without waiting for all of the zones in the system to close. When the zone closes, the system will then arm those zones. Force Arming is commonly used when a motion detector is protecting the area occupied by a keypad. Close zones in the desired area (except Force Zones). Press the (Padlock with Down Arrow) key. One-Touch Arming allows you to arm the system without using an access code. These features must be enabled by your installer. Press and hold the (back button) key for 3 seconds to arm all zones in the area. You can use this feature to allow specific individuals like service personnel (i.e. cleaners) to arm without giving them access to any other alarm system operations. Press and hold the (Person in House) key for 3 seconds to stay arm. With the system already Stay armed, press and hold the (person in house) key for 3 seconds to start the Exit Delay (see page 7). You can now leave the premises. When the Exit Delay elapses, the system will return to Stay Arming. With the system is already Stay armed, press and hold the key for 3 seconds to start the Exit Delay. You can now leave the premises. When the Exit Delay elapses, the system will switch to Regular Arming. With the system is already stay armed, press and hold the (Padlock with Down Arrow) key for 3 seconds to start the Exit Delay. You can now leave the premises. When the Exit Delay elapses, the system will switch to Force Arming. Press and hold the (Padlock with Down Arrow) key for 3 seconds to bypass any open Force Zones. A keyswitch can be used to arm and disarm the system. A keyswitch is programmed to Stay Arm or Regular Arm. A keyswitch can function as a Maintained or Momentary keyswitch. To arm the system using a Maintained Keyswitch, set the keyswitch to the ON position. To disarm the system set the keyswitch to the OFF position. To arm the system using a Momentary Keyswitch, set the keyswitch to the ON position then turn it back to the OFF position. Repeating this sequence will disarm the system. You can program the time at which your alarm system will automatically arm itself everyday. How Do I Program the Auto-Arm Timer? Press the (Back Arrow) key. Enter  for area 1 or  for area 2. Enter the desired [TIME]. Note: Your installer will have set the time as either International (24hr) or U.S. (12hr) format. If the format is U.S., select  for a.m. or  for p.m. time format. Note: A 60-second Exit Delay will start before the system arms. Auto-Arming can be cancelled by entering your access code. Your panel can be programmed to arm the system and/or send a report if no zone activity occurs for a pre-programmed amount of time. This is useful when supervising an individual with chronic health problems or who lives alone. Manual Bypass Programming allows you to program the alarm system to ignore (deactivate) specified zones the next time the system is armed. For example, you may wish to bypass certain zones when workers are renovating part of your establishment. Once the system is disarmed, the bypass entries are erased. Enter your [ACCESS CODE]. The (House) Icon flashes. If required, select the area whose zones you wish to bypass by pressing the  or  key. Enter the desired two-digit zone number (i.e. zone 3 = 03) or use the [s] or [t] buttons to scroll to the desired zone and press the (house) key. Repeat to unbypass the zone. If the zone number illuminates, the zone is bypassed. If the zone number is extinguished, the zone is unbypassed. Repeat step 4 until all desired zones are bypassed. Press the (back arrow) key to exit. The icon will illuminate. After disarming the system, the bypass entries are erased. The Bypass Recall Feature reinstates the previous bypass entries saved in memory. This eliminates the need to manually reprogram the bypass entries every time you arm the system. How Do I Recall Bypass Entries? Press the (Back Arrow) to exit. A Chime Enabled zone will advise you every time it is opened by causing your keypad to beep. How do I Chime Zones? Press & hold the  key for 3 seconds. Enter the two-digit zone number of the desired zone or use the [s] or [t] buttons to scroll to the desired zone and press the (Circle) key. Repeat to unchime the zone. If the zone number illuminates, the zone is chimed. If the zone number is extinguished, the zone is unchimed. To remove chiming from all zones, press the (Padlock with Down Arrow) key. Press the “X” key to exit. Note: Each keypad must be Chimed separately. When muted, the keypad will only emit the confirmation beep, rejection beep, and beep when a key is pressed. Therefore, when muted, the keypad will not beep during an alarm or during the exit delay. Press and hold the “X” key for 3 seconds to enable or disable Keypad Muting. If the keypad emits a confirmation beep, Keypad Muting is enabled for that keypad. If the keypad emits a rejection beep, the feature is disabled. Note: Each keypad must be Muted separately. Keypad Muting must be reprogrammed if your system suffers a total power loss. Upon request of your installer or monitoring station you may have to perform one of the following. Press the (Back Arrow) key, enter your [MASTER CODE] and press the (Speaker with “?”) key.This will send a test report code to the monitoring station. Press the (Back Arrow) key, enter your [MASTER CODE] and press the (house) key.This will initiate a call to the monitoring station that is using the WinLoad software. Press the (Back Arrow) key, enter your [MASTER CODE] and press the (Padlock with Down Arrow) key. This will force your security system to answer a call made by your monitoring station that is using the WinLoad software. Press the (Back Arrow) key, enter your [MASTER CODE] and press the (Person in House) key. This will cancel all communication with the WinLoad software if it has been initiated. You can modify the keypad’s setting to suit your needs. Press and hold  for 3 seconds. Backlight: the keypad’s light (7 is the brightest). Contrast: character intensity (7 is the lightest). Scroll: time between messages (7 is the slowest). Press [s] or [t] to modify the settings. Press the (Back Arrow) key to save and exit. Return to step 2 or press the “X” key to exit. 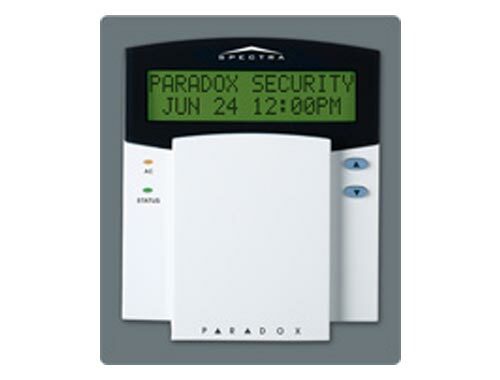 Your Spectra system is equipped with a partitioning feature that can divide your alarm system into two distinct areas identified as Area 1 and Area 2. Partitioning can be used in installations where shared security systems are more practical, such as a home office or warehouse building. When partitioned, each zone, each user code and many of your system’s features can be assigned to either Area 1, Area 2, or both areas. Note An area is the same as a partition. The term partition or partitioning is a term installers use to describe the division of secured premises into separate partitions or areas. Only your installer can partition your premises. If the system is not partitioned, all zones, user codes, and features will be recognized as belonging to Area 1. This section will provide an overview of the 1640’s functionality. This includes the use of action keys, indicator lights and visual feedback. NOTE: Many of the features in your system must be enabled by the installer. If the feature is not programmed, the keypad will emit a rejection beep and the action will be cancelled. The 1640 has action keys with which you can access its various functions as shown in Table 1. Stay Arm (Man in House) This method allows you to remain in the protected area while partially arming the system. Stay Zones are zones that are bypassed when Stay Arming. For example, when you go to sleep at night, doors and windows can be armed without arming other zones like motion detectors. Force Arm (Padlock with Down Arrow) During Force Arming, any open zones are temporarily “deactivated” so you can rapidly arm the system without waiting for all of the zones in the system to close. When the zone closes, the system will then arm those zones. Force Arming is commonly used when a motion detector is protecting the area occupied by a keypad. Function Key 1 (Circle) Press and hold to activate devices (i.e. garage door) or reset smoke detectors. Speak to your installer for more details. Function Key 2 (2 Circles) Reserved for future use. Zone Bypass (House Icon) Manual Bypass Programming allows you to program the alarm system to ignore (deactivate) specified zones the next time the system is armed. For example, you may wish to bypass certain zones when workers are renovating part of your establishment. Once the system is disarmed, the bypass entries are erased. Events in Memory (Speaker with “?”) All zones where alarms have occurred will be stored in memory. The system will erase the contents of the Alarm Memory every time the system is armed. System Trouble (Circle with “!”) Your alarm system continuously monitors fourteen possible trouble conditions. Most of these trouble conditions can be reported directly to your monitoring station. When a trouble occurs, the trouble icon will illuminate. N/A (Circle with “i”) Your alarm system continuously monitors fourteen possible trouble conditions. Most of these trouble conditions can be reported directly to your monitoring station. When a trouble occurs, the trouble icon will illuminate. The state of each light on the 1640 keypad represents a specific condition in your system as shown in Table 2. The icons on the keypad’s screen communicate your system’s status as outlined in Table 3. Indicates numbers corresponding to zones or option numbers. Numbers will illuminate to indicate that a zone is opened or when in trouble view mode will indicate the trouble. (Padlock with Down Arrow)(Zone numbers) Indicates which areas are Forced Armed. (Padlock)(Zone numbers) Indicates which areas are Regular Armed. (House with “-“)(Zone numbers) Indicates which areas are Instant Armed. (88:88)AM/PM Indicates the numerical values for the time, sections, section data, options and codes. (Musical Note) Indicates which zone is in Chime Mode. (Fire Icon) Indicates zones that are in Fire Alarm. (Circle with “!”) Indicates system troubles. (House Icon) Indicates bypassed zones. (Speaker with “?”) Indicates alarms stored in memory. Confirmation Beep: When an operation (i.e. arming/ disarming) is successfully entered on the keypad or when the system switches to a new status/mode, the keypad produces an intermittent beep tone (“BEEP-BEEP-BEEP-BEEP”). Rejection Beep: When the system reverts to previous status or when an operation is incorrectly entered on the keypad, it will emit a continuous beep tone (“BEEEEEEEEP”). In case of emergency, the Spectra system can provide three panic alarms that can immediately generate an alarm after simultaneously pressing and holding two specific buttons for three seconds. Based on your needs, these panic alarms can generate audible alarms (sirens or bells) or silent alarms and can communicate specific messages to your monitoring station. For instance, pressing  and  can mean “call the police” or anything you require. Press and hold buttons  and  for the police. Press and hold buttons  and  for a medical alarm. Press and hold buttons  and  for a fire alarm. Your system can use either 4- or 6-digit access codes, where each digit can be any value from 0 to 9. Six-digit codes are considered more difficult to “crack” and therefore, more secure. Avoid programming simple or obvious access codes, such as your telephone number, address or codes such as 1234. How Do I Delete Access Codes? Repeat steps 1 to 3 (see above). Press the (Padlock with Down Arrow) key once for each digit in the access code (4 or 6 times) until the keypad emits a confirmation beep then press the “X” key to exit. Do not delete the System Master Code. Note: After entering the section number from the Table below, the 1640 will only display the first two digits of your code. Once you have entered the second digit, the third and then the fourth digit will appear. If the format is U.S., select “1” for A.M. or “2” for P.M.
How do I Program the Time? Upon a fire alarm, the bell/siren will emit three “squawks” at 2 second intervals until silenced or reset by entering a valid access code. If the zone is a Delayed Fire Zone, there is a delay before the system contacts the monitoring station. This will prevent unnecessary reporting of false alarms. If there is no fire condition, contact your monitoring station immediately to avoid an unnecessary response. What Do I Do if a Delayed Fire Zone Was Activated? Press the “X” key within 30 seconds of the alarm. Try to correct the problem. If the problem persists, the alarm will sound again. Press the “X” key again. This instructs the system to delay reporting the fire alarm to the monitoring station. Cooking is the leading cause of home fires in the U.S. It’s also the leading cause of fire injuries. Cooking fires often result from unattended cooking and human error, rather than mechanical failure of stoves or ovens. In the event of a fire, escape first, then call for help. Develop a home fire escape plan and designate a meeting place outside. Make sure everyone in the family knows two ways to escape from every room. Practice feeling your way out with your eyes closed. Never stand up in a fire, always crawl low under the smoke and try to keep your mouth covered. Never return to a burning building for any reason; it may cost you your life. Finally, having at least one working smoke alarm dramatically increases your chances of surviving a fire. And remember to practice a home escape plan frequently with your family. With the system disarmed and the (circle with “~”) light is ON, activate motion detectors by walking in the protected area. Open and close protected doors and verify that the corresponding key illuminates. Your installer can advise you of the best way to test your particular system. Do not use open flame or burning materials to test your fire detection devices. Contact your installer for safe methods of testing your system. Your alarm system continuously monitors fourteen possible trouble conditions. Most of these trouble conditions can be reported directly to your monitoring station. We strongly suggest that you inform your monitoring station of the trouble and allow them to service your system. Note: The keypad can be programmed by the installer to emit a beep every 5 seconds whenever a new trouble condition has occurred. Press the (Circle with “!”) key to stop the trouble beep. When a trouble condition occurs, the (Circle with “!”) icon will illuminate. How Do I Access the Trouble List? Press the (Circle with “!”) key. The (Circle with “!”) icon will flash and number(s) corresponding to the trouble(s) will illuminate. Read the corresponding explanation of the trouble from the trouble list. If no repair instructions are given, call your monitoring station for repairs. Press the “X” or the (Circle with “!”) key to exit. The backup battery is disconnected or the battery voltage is getting low. The battery voltage in a wireless transmitter is low. The system has detected a loss of AC power. This trouble usually occurs during a power failure. If a power failure is not occurring in your establishment and this trouble appears, contact your monitoring station for service. Any device connected to the Bell or PGM2 output is no longer connected to your alarm system. During an alarm, the bell output, which uses a fuseless circuit, will automatically shut down if the current exceeds a predetermined value. When the system is disarmed, the current is cut from the bell output and the trouble warning may extinguish, but the trouble may reoccur during the next alarm if the situation is not corrected. The auxiliary output, which supplies power to your alarm system’s accessories, uses a fuseless circuit to protect the power supply against current overload and automatically shuts down if the current exceeds a predetermined value. Your alarm system, if monitored, could not communicate with the monitoring station. Your alarm system’s clock must be reprogrammed.This is the only trouble that we recommend that you correct. Press the  key to change the time. A wiring problem is occurring on one or more zones. Press the  key to view which zones are affected. Note: After pressing the  key, the 1640 will display the (Circle with “!”) and (Tamper) icons with the corresponding number of the zone(s) in tamper. The (Circle with “!”) and (Tamper) icons will extinguish once the tamper condition has been resolved. The system has not detected the presence of a telephone line for more than a pre-determined period of time. A wiring problem on the fire zone is occurring. A module is no longer communicating with your system. A wireless transmitter is no longer communicating with its receiver or its batteries are disconnected. To view on which zones the Wireless Transmitters are experiencing trouble, press the (Speaker with “?”) key after step 2 from the Trouble Display. If for any reason your keypad is no longer communicating with your alarm system, the keypad will emit three consecutive beeps at 3-second intervals. When communication is restored, the keypad will resume its functions.